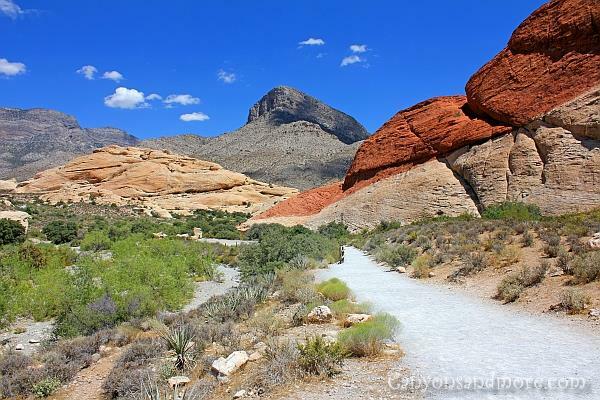 This natural attraction is a short drive from Las Vegas and a fantastic way to get away from the city for a day. For just 7 dollars (as of summer 2010) you can spend a day hiking, climbing or just simply enjoying the scenery of this fascinating area. The visitor guide you receive explains everything you need to know about the area and has tips and pointers about the wildlife and hiking trails. The image above shows one of the many trails that can be found at the park. Pack plenty of water, park the car and get out and enjoy this beautiful country. 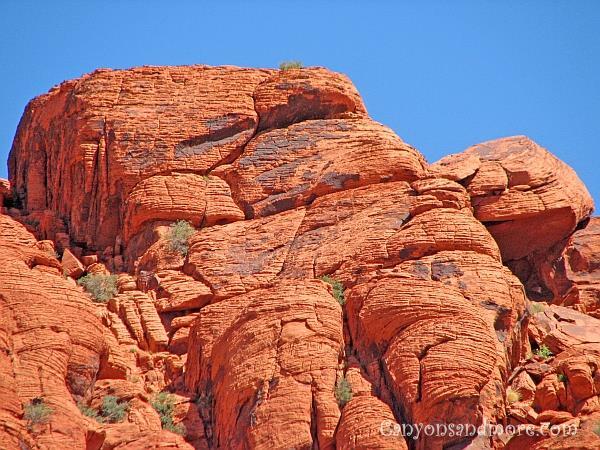 Just look at how many colors of rocks can be found at this location. 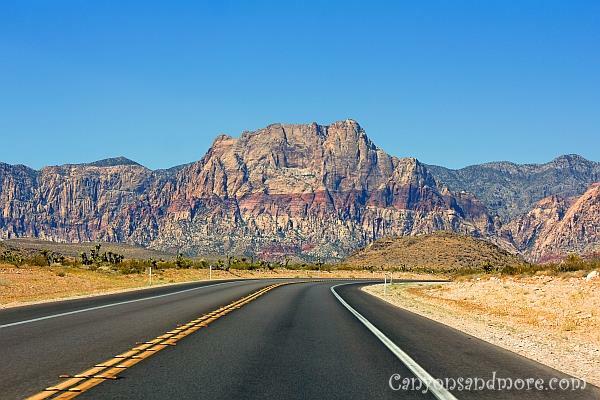 The drive from Las Vegas to the Red Rock Canyon takes you over an idyllic desert like landscape with gorgeous views of mountains in front of you. It is such a welcoming contrast to the hustle and bustle of the city. It is highly recommended to stop at the visitor’s center once entering the park. 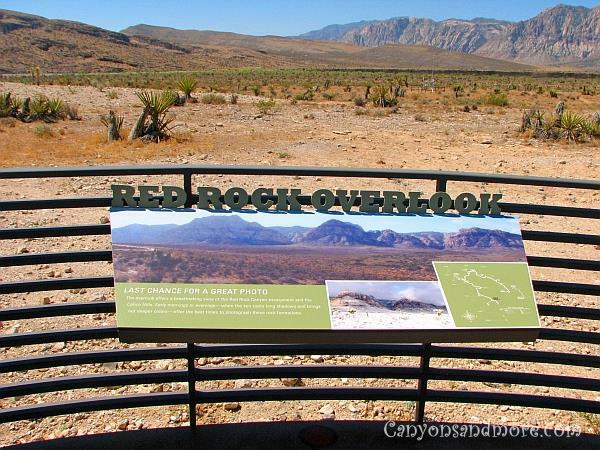 This modern area is full of exibitions explaining the geology and the ecology of the area as well as the history of its formation. Outdoors there is a platform offering a majestic view of the mountain range located behind the center. Different exibitions showing the elements of nature such as earth, wind, fire and water are also well explained and demonstrated and information about the flora and fauna of the area can also be found. Once leaving the visitor’s center at the entrance, you just follow the scenic drive which is about 21 km round trip on a winding road. You will find plenty of vista parking areas to stop and get out to take pictures, stroll on many of the trails or to climb rocks. It hardly takes any time to completely drive around the park so enjoy the stops and take time to enjoy the beauty of the landscape. 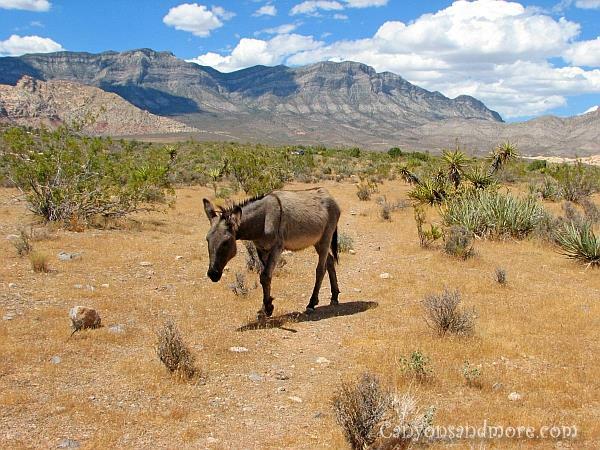 While taking pictures of the landscape, this free roaming burro suddenly appeared out of nowhere. He stood and looked at us for a moment and then went on his way into the hills. It felt like a blessed moment, somehow, to be this close to wildlife in its natural habitat. When driving around the park, please drive slowly as not only are there burros in the area, but also other wild animals as well. 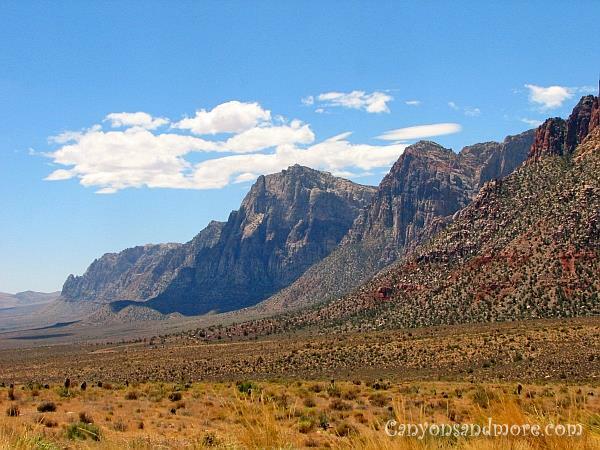 This is a fantastic view of the Spring Mountains. Mount Wilson, Rainbow Mountain and Bridge Mountain are the names of a couple of mountains of this range. 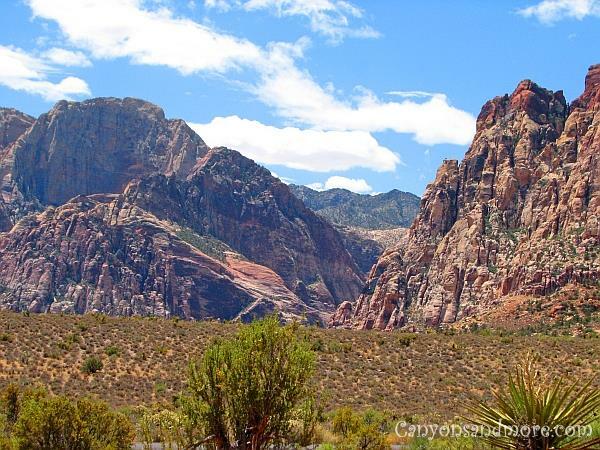 There is something so quiet and peaceful about the Red Rock Canyons. The panaroma is breathtaking no matter which direction you look and a lovely retreat. Because the park is small, you can stop at each of the stopping points. This is the Calico Hills Overlook. Calico is a great description for the rocks of this whole area. Many shades of colors can be seen and this is one of the areas highly recommended to stop at if you wish to make breathtaking photos. 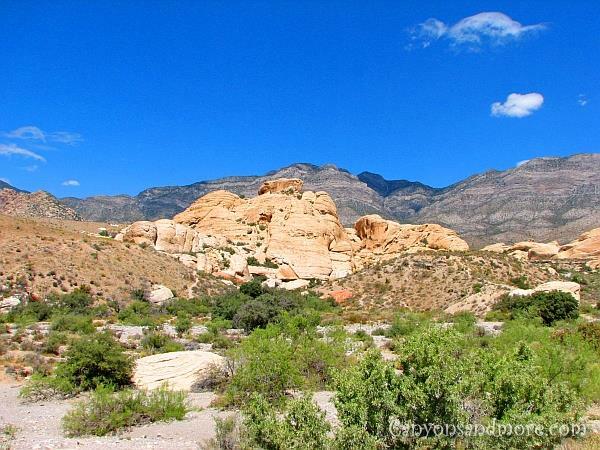 You will get a good impression of the many types of rocks and there are lots of hiking and climbing possibilities. 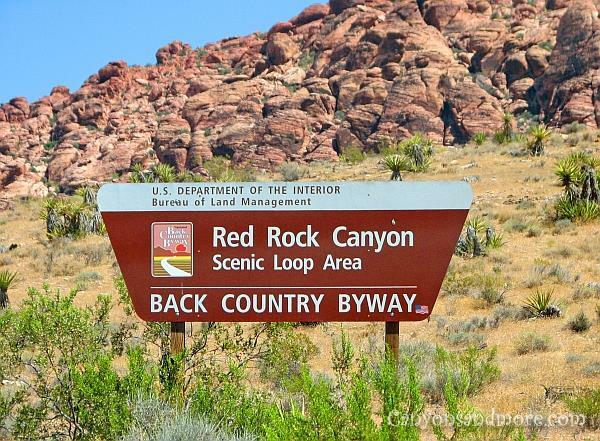 The name “Red Rock Canyon” says it all and you will find examples of these all around this park. Many are piled so high and look like an open invitation to be climbed. 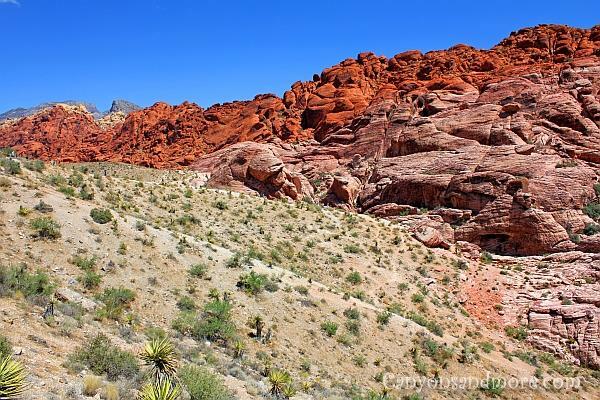 The Valley of Fire State Park in Nevada is also dominated with these red rocks. You can really spend a whole day wandering around this region. There are a lot of trails and many people from all over come here to climb the rocks. Make sure to have plenty of water with you as there is no possibility to purchase water, except at the visitor’s center.